Lately, I have been looking for books to read that are about small book stores, after reading two fabulous books, The Storied Life of A.J. Fikry and The Readers of Broken Wheel Recommend. 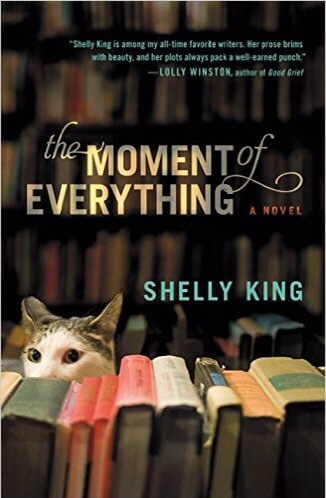 I had read about The Moment of Everything, previously, and thought that it looked interesting. Unemployed, Maggie Dupres spends all of her time in The Dragonfly’s Used Book store, dreaming of better days and reading bodice ripper, romance novels. Her best friend, Dizzy, claims that there are two spots in this book club that her previous employer is in that would be great networking for her, with the possibility of getting her old job back. This book, however, wasn’t as straightforward as the premise led me to believe. This story was actually about Maggie’s journey. A discovery that the path she had been taking, may not have been towards fulfillment, and that this small, rundown used bookstore might actually lead her towards happiness, in life and love. The synopsis below was taken directly from Amazon.com. Maggie finds some private notes in a copy of Lady Chatterly’s Lover, and posts them online, as a way to help out the new website she had set up for Dragonfly, and the letters went viral. I loved those love letters, and I think everyone woman that reads this book will wish that their significant other would express their love this way. Love notes are so very romantic! Maggie does, of course, have a love interest in this book, and their chemistry is great, but the real story lies within Maggie, and her discovery of the person she was meant to be. Books about bookstores and libraries are my favorites to sit with. I have a YA novel about a Great Library that holds people hostage. It is a series.. Book 1 is called Ink and Bone. Like you I read both of those books, A.J. Fikry and The Readers of Broken Wheel. I need more. This one sounds dreamy. It’s a good one. I’ll look yours up too! I’m on a bookstore kick!